The Ward: Wednesday, May 20, 7pm, you’re invited to join us for the book launch of The Ward: The Life and Loss of Toronto’s First Immigrant Neighbourhood at the Church of the Holy Trinity, 10 Trinity Square. See our previous post here. The Cultural Landscape Foundation (TCLF): Friday, May 22, 8:30am, as part of the TCLF conference series, Second Wave of Modernism III: Leading with Landscape will take place. The conference will tackle numerous issues including those that deal with the city’s identity – what does it mean for a 21st century city to be historic and modern at the same time? – and stewardship – what new models for public/private financing and management are emerging? ERA’s Brendan Stewart and Michael McClelland will be among the presenters. The conference will be held at Isabel Bader Theatre, 93 Charles St. W.
Click here to purchase tickets for the conference. Toronto the Good (TTG): Friday, May 22, 6:30pm, our annual party to celebrate Toronto and contemplate its history and evolution with fellow architects, designers, thinkers, and urban-minded people. This year, TTG will be hosted in partnership with the TCLF conference. Join us at the Fermenting Cellar in the Distillery District, 28 Distillery Lane. 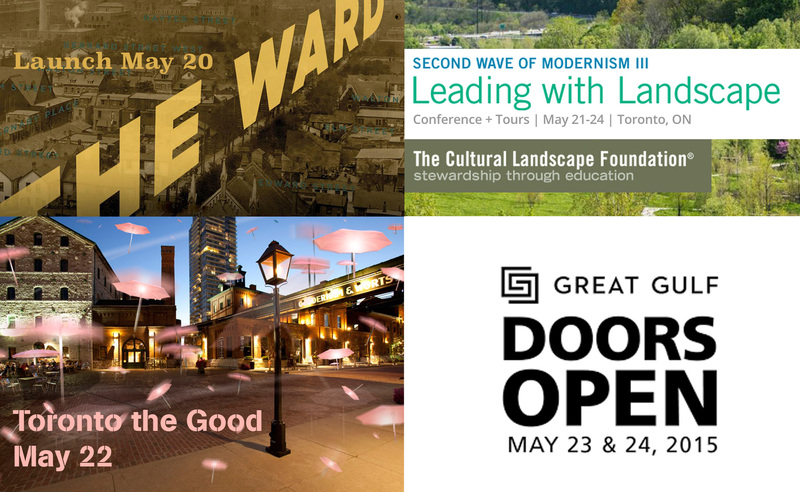 Doors Open Toronto: The 16th annual Doors Open Toronto presented by Great Gulf returns on Saturday, May 23 and Sunday, May 24, offering free and rare access to more than 155 architecturally, historically, culturally, and socially significant buildings across the city. This year’s theme – Toronto 2015 Pan Am/Parapan Am Games. ERA’s Andrew Pruss will lead a tour of the Distillery District on Saturday May 23, 3:30 – 4:30pm. Click here to register for free walking tours.